The U-turn is about as extreme as it gets when changing direction. this comes in handy when there is no room for small intermediate steps, for example if your wheels are aligned on a narrow edge or just gripping onto ridiculous spots. The rear wheel pivot approach will set you back a bike's length. 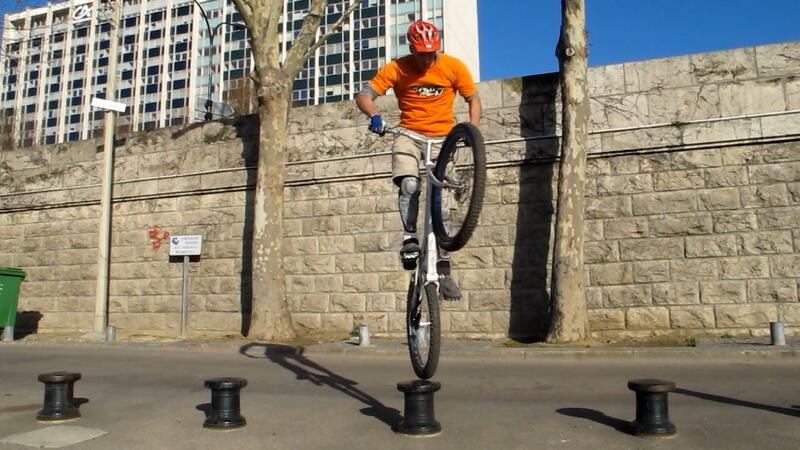 The front wheel pivot will require some landing spot in front of you. Now if you are balancing onto sharp edges and there is nothing around, your only option is a clean and sharp U-turn on the spot assisted by a brief pedal kick. In all these techniques, body weight shifting is key, with both brakes locked at all times except during the brief pedal kick. Being able to pivot on the rear wheel in one move rather than in small successive hops is a handy shortcut to perform a change of direction. The rear wheel pivot approach will set you back a bike's length. It is usually easier to spin in the direction opposite your front foot side (i.e anticlockwise if you are right foot forward). Swing your hips to assist the rotation. Start from a comfortable trackstand position with both brakes locked. 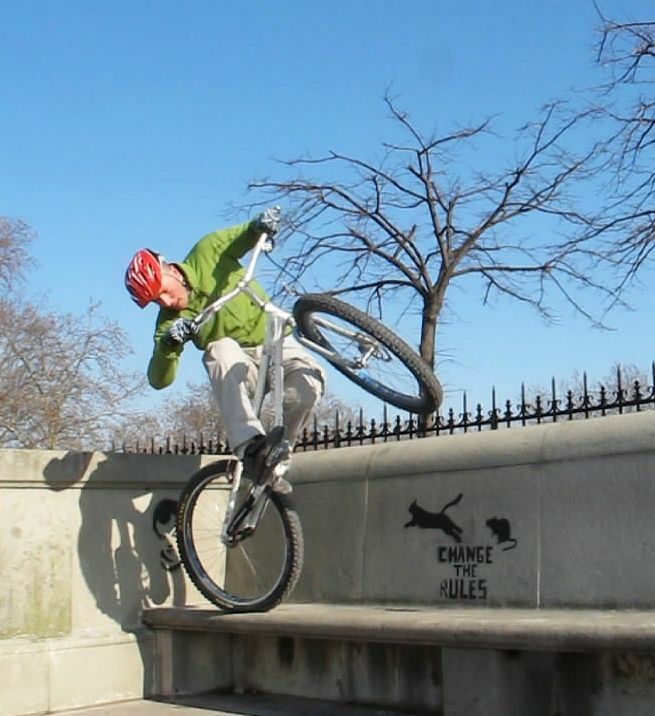 Crouch and lean over the bars while turning the front wheel on your front foot side. 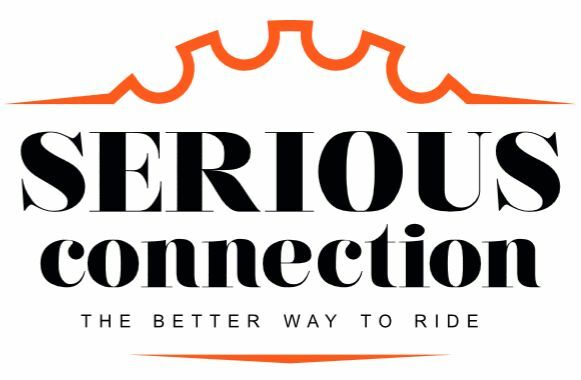 When ready, thrust yourself away from the handlebars, pushing vigorously on the front wheel. As you shift your weight back, swing the bars to the side of your lazy foot. Pulling up the front wheel to follow your torso. Assist the rotation with your torso, with a twist of your hips in the opposite direction. The bike stands up or even hops on site from the rear tyre bounce-back effect, stay well centered over the rear hub. Focus on maintaining your balance over the rear wheel axis, over the same spot so at not to be thrown sideways The friction will slow you down, stay tuned above the rear hub until you face your front wheel target. 1° Start from a comfortable trackstand position with both brakes locked. Crouch and lean over the bars turned on your front foot side. 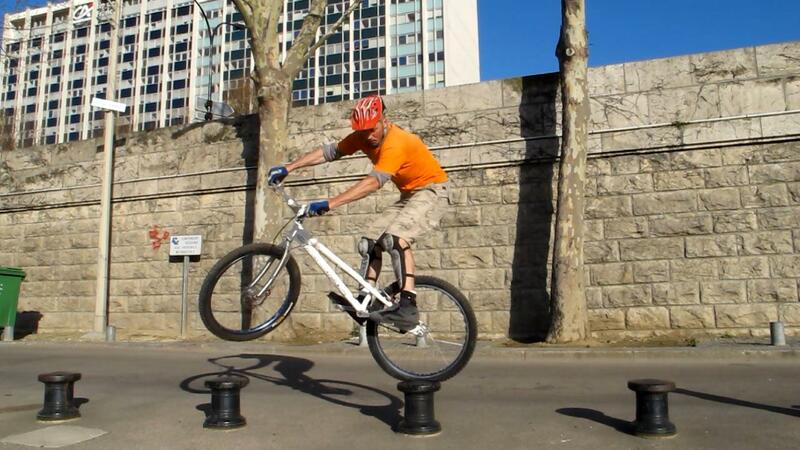 2° When ready, thrust yourself away from the handlebars, pushing vigorously on the front wheel. 3° As you shift your weight back, swing the bars to the side of your lazy foot. Pulling up the front wheel to follow your torso. 4° The bike stands up or even hops on site from the rear tyre bounce-back effect, stay well centered over the rear hub. 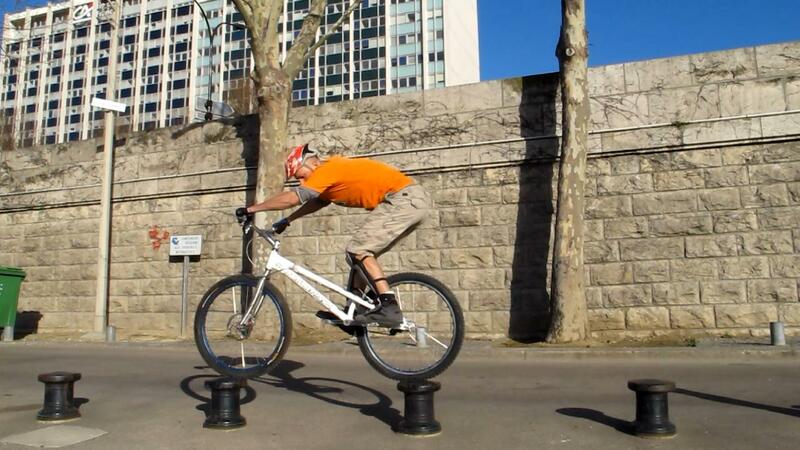 5° Focus on maintaining your balance over the rear wheel axis, over the same spot. 6° The friction will slow you down, stay tuned above the rear hub until you face your front wheel target. Swinging your hips and swirling your shoulders make up most of the move. On a smooth or slippery surface, you can keep your rear brake locked into a full stop and spin nicely. If you swing your body correctly, the rotation comes quite effortlessly. 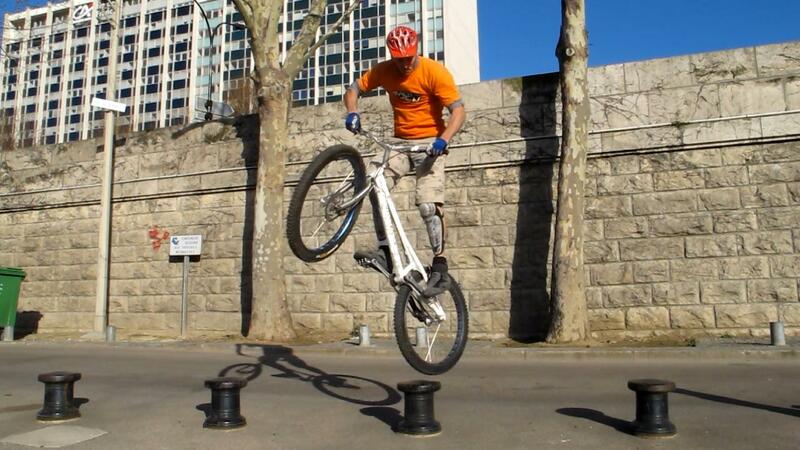 You can reduce the spin with precision by leaning forward and push the front wheel down to a full stop on the ground. After some practise, you'll be able to perform full turns just for the fun before a drop-off or another transition. On a gripping surface, tyre friction will stop the bike from spinning fairly quickly (maybe half-way through a 180° spin), but you can cheat on friction by occasionally releasing the rear brake and letting the wheel roll a few inches. A slight pedal stroke (not a kick) while releasing the rear brake will allow the rear tyre to roll and re-adjust to the new direction. Learning the 180° spin will mainly help you master the 90 degree pivot on the rear wheel, which will be useful in many situations. Taking off the rear wheel prevents being stuck during the rotation. Once you master the pivots backwards and you know your marks well enough, you can try this with both wheels resting on edges, for example with the bike bridging a gap. As long as you can push on the front wheel to turn and accelerate backwards, you will get enough rotational inertia to spin. 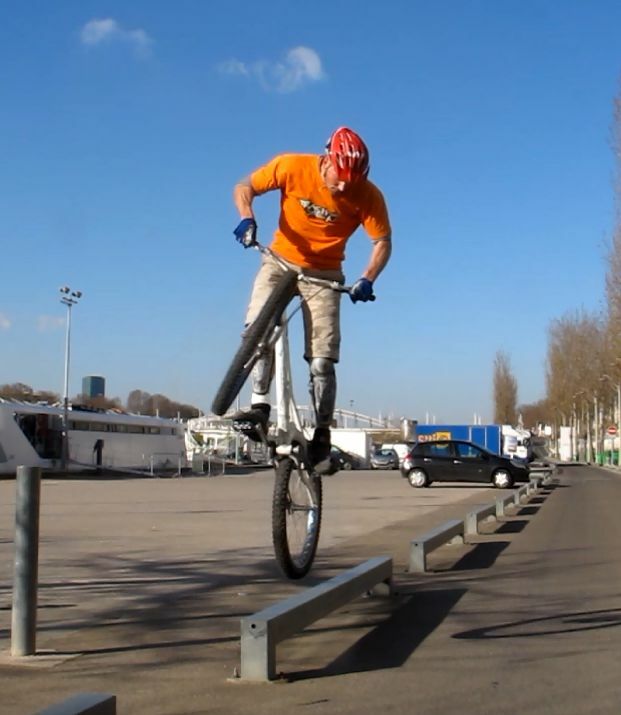 On a railing or on any sharp edge, you must absolutely hop the rear wheel off the edge so as to be able to turn beyond 90°. Otherwise, the rear tyre may slip off your spinning point and get stuck on one side of the edge as you crash with inertia onto the other side. Perform a brief hop at about 90 degrees of the rotation. With a brief hop at around 90 degrees of rotation (pulling up on the bars and tucking the knees), you can land again perpendicular to the edge for maximum support and grip, facing the other direction. In order to control your turn at 180 degrees and finish ready for a pedal kick, you'll have to tune very carefully your initial rotation. The effort you should put into the rotation will depend on the friction of the rear tyre with the obstacle or the grip of the edge you are spinning on, but also on the hop that you will be launching (since there is no friction while you are in mid-air). Don't over-do it or you will spin too much and you will end up being dragged out of balance before you can adjust again on the bike, facing the edge in the opposite direction. 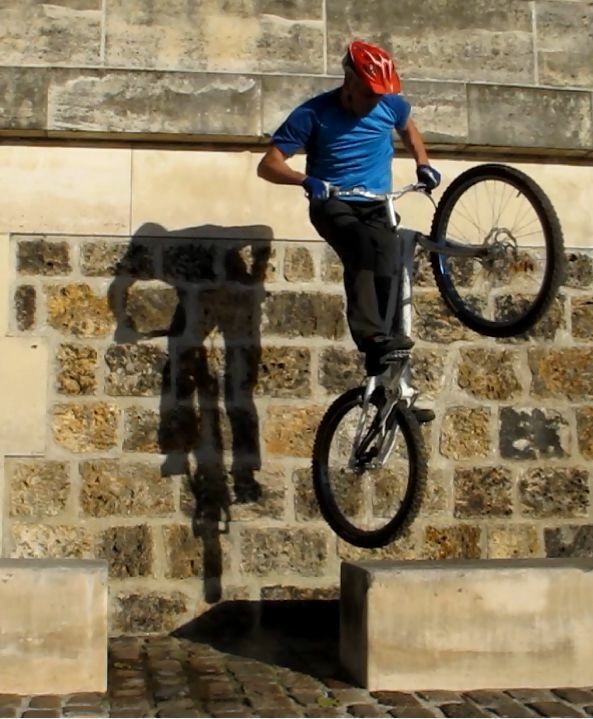 In fact, this is a neat combination of a back hop and a rear wheel pivot.